If salads leave you unsatisfied and hungry, you’re doing salads wrong. Raw spinach tossed with a vinegary, low-fat dressing and three sliced almonds lacks nutrients and stick-to-your-ribness. Nobody enjoys eating that for a meal. The secret to a satisfying salad is the dressing. Low-fat dressing is a perversion of the modern diet, and it guarantees that you’ll feel hungry shortly after your meal. Plenty of healthy fats in dressing ensure the absorption of nutrients and provide satiating, long-burning fuel. Also important, fat is what makes vegetables taste good. Take a look at any cookbook from before the 1990’s low-fat era — all recipes for raw and cooked vegetables include copious amounts of butter, cream and/or egg yolks. When we enjoy vegetables that taste good and fill us up, we leave the meal nourished and satisfied. As a result, our blood sugar stays balanced and we free ourselves from sugar and carb cravings. Paleo Sesame Ginger Dressing includes toasted sesame oil, coconut aminos, and fresh ginger to hit the major flavor notes: sweet, salty, umami, and slightly spicy. I enjoy this dressing as a dip with cucumber slices and carrots, as well. And the next time you roast chicken wings, have this ready as a sauce. Whisk together all ingredients, or use an immersion blender to make quick work of the mixing. If desired, top your salad with gomasio, a nutrient-dense blend of sesame seeds and sea vegetables. The dressing keeps for a week in the fridge. 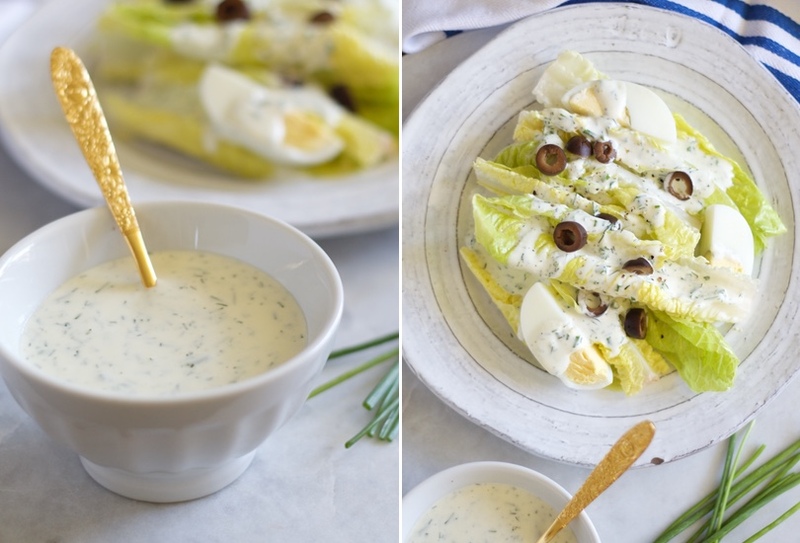 This Basil Dijon Dressing tastes as vibrant as spring. Fresh basil and lemon juice add freshness, and dijon adds a hint of warmth and depth. I love this dressing on fresh tomatoes as well, or with sliced bell peppers for dipping. Whisk together all ingredients, or use an immersion blender to make quick work of the blending. 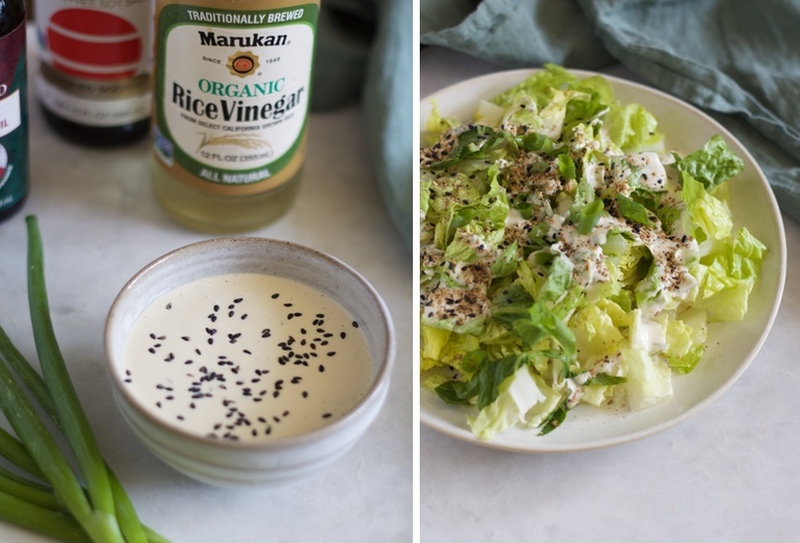 When I began a grain-free and dairy-free diet to heal my autoimmunity, I thought I would never be able to recreate a ranch dressing without the traditional ingredients of sour cream and buttermilk. I’ve happily proved myself wrong. 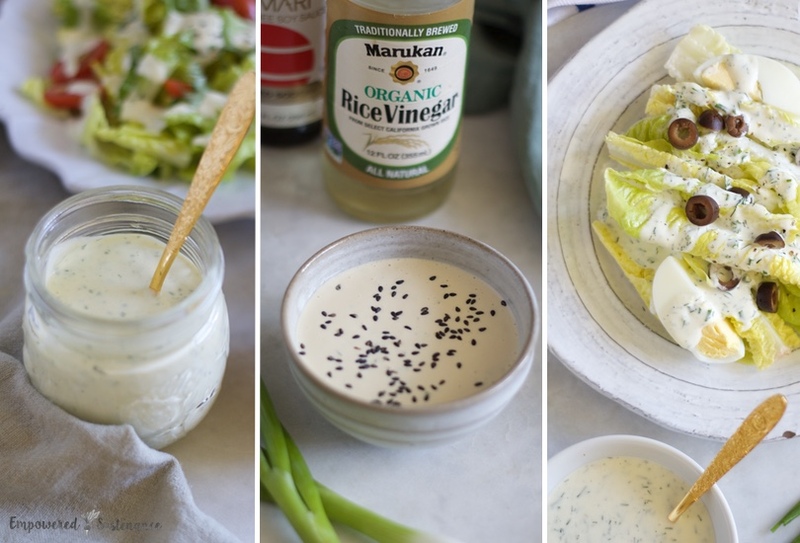 This dairy free ranch dressing relies on the flavor of fresh herbs, instead of MSG and refined sugar. Because it tastes like food rather than chemicals, the flavor beats Hidden Valley. 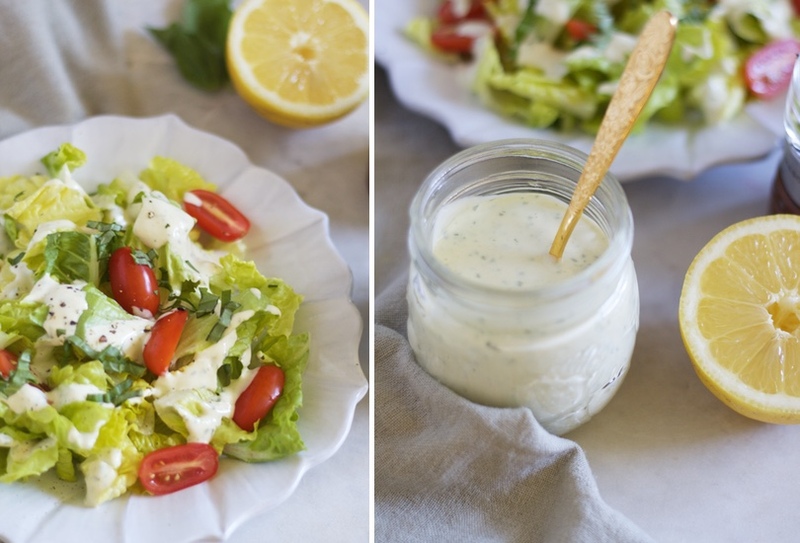 Click here for the Dairy Free Ranch Dressing Recipe. I just recently found this site via the diabetesforum.com and have to say that this combo of info is exactly what I needed to verify that my ‘gut instincts’ were right all along. Four days ago, I stopped using all grains, no refined sugar (and for now, just to added sweetener of any sort…aside from a small scoop of inulin today). Also started a script for Candida-specific antibiotic 10 day course at the same time, and–sadly–Metformin. My goal is nutrition-controlled/reversed DM type 2, reverse the years-standing metabolic syndrome x, celaic disease, psoriatic arthritis, undifferentiated connective disease, etc. I’m off to a good start but am most optimistic about finally finding a way to eat that works for me. Have already noticed a reduction in muscle and joint pain as well as just a general sense of greater well being. Does anyone know of a Dijon Mustard that doesn’t have distilled white vinegar ingredient? DWV is almost always made from corn. I like Annie’s honey mustard that is made with apple cider vinegar, but I know Lauren’s on to something with the dijon flavor. Thanks! Thanks for sharing this fantastic paleo recipe…..I really appreciate it. wow, that’s delicious, thank you for sharing the way.